The Canadian Mental Health Association, Ontario (CMHA Ontario) welcomes this opportunity to comment on the Mental Health Commission of Canada’s draft framework for a Canadian mental health strategy. We are pleased with the overall direction of the framework. The focus on recovery, mental health promotion, accessibility and responsiveness, evidence-based practice and research, and reducing discrimination are very important. We also support the development of a broadly-based social movement that will support the achievement of these goals. We have some comments about the framework overall, suggestions about specific goals, and advice on next steps in developing the framework. This framework identifies high-level goals that are more representative of a vision. CMHA Ontario recommends that the MHCC define more specific goals that can be achieved. Our recommendation is that the MHCC also develop objectives that are specific, measurable, achievable, realistic and time sensitive. Objectives will enable us to determine what aspects of the strategy have been successful and which have not, so that the strategy can be renewed for the next period of time. CMHA Ontario would like the Commission to develop a draft strategy with both goals and objectives and send it out for review by all those who would be involved in its implementation, as well as others who self-identify as stakeholders. With respect to a vision, we also recommend the national strategy include a vision statement, as has been done in other jurisdictions, such as New Zealand. To be able to set realistic and achievable objectives, it will be necessary to assess opportunities in the current environment, identify promising practices and evidence, and to analyze strategically what will be most effective at this point in time. This kind of analysis is missing in the draft. We look forward to a more full analysis as the strategy proceeds. 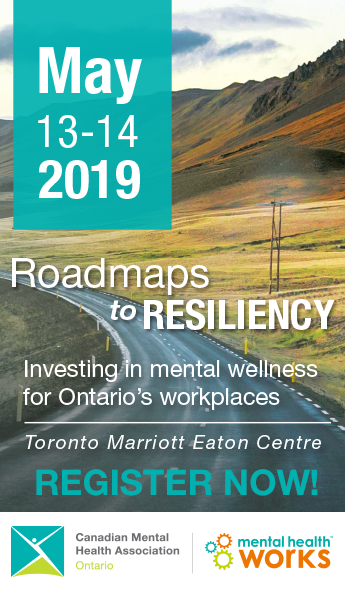 The strategy should take into account federal, provincial and municipal jurisdictions in which mental health and mental illness will need to be addressed in order to achieve goals defined by a mental health strategy which has been created at the national level. The strategy should more explicitly address opportunities to promote mental health and enhance services and supports for persons with mental illnesses across sectors and in the community. The strategy should also be clear about where accountability lies for the achievement of goals. The draft includes some discussion about individual responsibility, provider responsibility and system-level responsibility in the discussion of many of the goals. The strategy should be clear about what is within the scope of service providers and what is beyond that scope and/or more effectively done at the systems level. The draft framework wavers in its commitment to tackling challenges that are broader than the scope of the mental health system. On the one hand, the MHCC sets the goal to eliminate stigma and on the other hand the framework states that addressing the economic needs of people with mental illness is beyond its scope. These are both challenging issues that are beyond the scope of the mental health system, yet the MHCC states that one is possible and the other is not. It is important that the mental health strategy address cross-sectoral needs and root cause challenges of people with mental illnesses. Setting realistic and strategic goals will make this possible once the commitment to addressing these issues is there. We agree that it is beyond the scope of the MHCC to create an equitable society, but we think it is within the scope of a national strategy to set goals concerning access and enhancements regarding housing, income, employment and education — four areas that are extremely important to recovery. At the end of the chapter on goal 7, the draft document states that the strategy will call on all sectors to work together on issues related to income and housing, but a call to work together is not as strong as a goal. Something stronger about what will be done about access to the social determinants of health is an important part of a national strategy. Goal 1, the hope of recovery is available to all, is general and focused on the individual. This goal should be about reorienting the mental health system to become a recovery-based system. The focus should be on what the system of services and supports for people with mental illness would look like if all people with mental illness using the system were supported in their recovery. This chapter of the draft framework supports recovery as an essential element and describes many aspects of what that would involve. The wording of the goal does not reflect the document’s emphasis on a system focus or on making recovery front and centre within the strategy. Goals 2, 4 and 5 address important issues for the mental health strategy. We are pleased to see an emphasis on mental health promotion, the role of families and the importance of a seamless system. We do not have anything to add other than the general comment made earlier that like all the goals, the wording of these goals describes a vision rather than strategic goals for a period of time. Goal 3, which speaks about the cultural safety and responsiveness to diversity of the mental health system, addresses the importance of inclusion of people from diverse cultures. The language of the goal does not suggest everything that is included in the discussion. The chapter on goal 3 discusses the need to recognize and address issues of power and oppression as well as understanding of differences related to culture, age, gender, sexual orientation, language and geographic location. The term “cultural safety” is not familiar to Canadians and it is not intuitive that this term would address all of this. The goal would be more powerful if it named the full range of the issues the goal is intended to address. Both goals 3 (cultural safety) and 7 (stigma and discrimination) provide an opportunity to address inclusion, a concept that is familiar in mental health, but which is not used in the draft framework. These goals should address the importance of inclusion of people with mental illnesses in community life, as well as inclusion in the mental health system of people with differing socio-cultural identities and those whose experience of mental health and the health system is shaped by a history of racism and oppression. Goal 6, which addresses the need for more research, measurement of outcomes and evidence-based practice, is an excellent goal. CMHA Ontario would add to this the value of fostering innovation, recognizing that innovative initiatives do not always have a strong evidence base when they begin. We fully support the importance of the advancement of research and outcome measurement in community-based services and supports and the framework’s suggestion that promising practices be evaluated quickly. It is important to balance that with funding guidelines and program standards that encourage innovation. We are pleased that goal 7 addresses discrimination against people living with mental health problems. We are concerned that the goal is a bit lofty. It is not within the scope of a mental health strategy to completely eliminate discrimination and stigma. The wording of goal 7 needs to be more achievable. Goal 8, the creation of a broad-based social movement, is not a goal for a mental health strategy. It is a process that is necessary to build support for the strategy and to achieve strategic goals. The social movement, rather than being a part of the strategy, should be encouraged by the Commission as it works. To date, the Commission has not given adequate attention to creating open, transparent processes that would build support for its work. Many activities have taken place behind closed doors. The consultation process for the draft framework is one example. Meetings across the country began before the consultation process was announced; the list of organizations and individuals being consulted is not public; and there has been no explanation of the basis upon which participants were chosen. The MHCC should be using this consultation period as an opportunity to build the social movement. In addition, where the MHCC speaks of building a social movement it would be helpful to acknowledge and support the thousands of volunteers across Canada who are already committed to mental health, the people who volunteer on board and committees, in hospitals and in community programs to improve the lives of people with mental illnesses. These are the ‘roots’ of a social movement. The MHCC should be a catalyst for this direction. Developing a mental health strategy for Canada is challenging and difficult to do. CMHA Ontario congratulates the Mental Health Commission of Canada on its recognition of and the depth of understanding of key issues facing people living with mental illness, the service system and the mental health of Canadians in general. We look forward to contributing to future developments in the national strategy.